The 91 connector series is an improved, miniaturized version of the conventional 62 series (C type) and 58 series (S type). 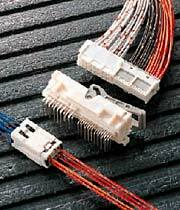 Multi-way, light-insertion, and lever-system connectors are available. This series consists of 030 and 090 types (030, 090, and 250 types for the hybrid model) classified according to terminal size, supporting use in a variety of control circuits and low power circuits. -Retainers are pre-mounted on the connector housing, and are structured to enable setting by the same simple operation regardless of the number of ways, improving operability. -An inertia locking system is used to prevent semi-engagement (this system is not incorporated in some connectors). -Standard connectors can be directly secured to a bracket on the car body. -A PCB model is also available for connection to printed circuit boards.